WILLEMSTAD - Curaçao Animal Rights Foundation (CARF) is organizing a puppy adoption event on Saturday 27 January at Beshiweg 1 in Dominguito. 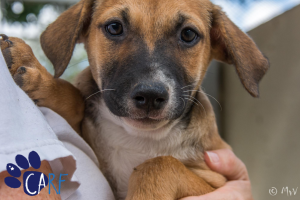 Anyone who is considering buying a dog is welcome between 10 a.m. and 12 noon to get acquainted with the CARF dogs and the volunteers who take care of them. "We have saved a lot of puppies over the past few months, some of them have been dumped by their owners, we do not know from other puppies if they have ever had a boss." All dogs that are present on Saturday have been treated and declared healthy by a licensed veterinarian. The focus during this Meet & Greet is really on our puppies, we hope that as many of them as possible find a new loving home this weekend, they deserve it!" says Sylvia Minten, a volunteer at CARF for several years. Anyone who falls in love with a dog during the Puppy Meet & Greet can ask for more information about the dog in question during the event. When there is interest to adopt a specific dog, a follow-up appointment is made for a so-called home check. The CARF team supervises the adoption intensively so that every dog ​​ends up with the right owner. Even animal lovers who cannot or do not want to adopt a dog are welcome on Saturday. They can cuddle with the puppies, gather information about the CARF foundation, register as a volunteer or bring a donation. In addition to monetary donations, CARF always needs dog food from Purina ProPlan, fleece blankets, old towels and toys for the dogs. For more information, see www.carfcuracao.com or www.facebook.com/carfcuracao. Emails can be sent to stichtingcarf@gmail.com.